He is better known as a dancing senator, having turned dancing to his past time shortly after he became a senator more than a year ago after the death of his brother, Senator Isiaka Adeleke aka Serubawon. Since then, Senator Demola Adeleke has become a star of sort as people now recognize him more for his dancing prowess than for this job as a lawmaker in the red chamber. Having won the election in a landslide victory last year, Demola believes his sudden rise into political stardom can do the magic the second time now on a bigger scale as the governor of the State of Osun. Demola Adeleke is the last child of the Adeleke family from Ede, Osun State, their father being a former senator during the second republic. The late Senator Isiaka Adeleke was the most popular among them, though he was not the first child, he had an elder brother,who is very quiet and easy going. They have a brother, Deji, ‘Baba Olowo,’who happens to be the richest among them, and thefather of music sensation, David Adeleke aka Davido. Dr. Deji Adeleke made sure he complied with the instructions their late mother gave him that whatsoever he has in life, he must make sure that Demola too has the same in houses, cars and all aspect of life, but reports have it that Demola is the most indulged child among them all. We were told that Demola has never worked in his entire life, though he has houses in Atlanta, Abuja,Ikeja GRA, UK and Lekki all due to the benevolence of his brother, Deji based on the instructions of their mother. We were informed that Deji wasapproached by the leaders of the Peoples Democratic Party (PDP) in Osun State to become the party’s governorship candidate, but that he turned down the offer and recommended Demola for the coveted office with a promise to provide all the required financial and related support needed to prosecute the campaign. Sources told us last week that Demola has since begun a massive campaign to succeed Ogbeni Rauf Aregbesola as the Governor of the state of Osun and that he is being emboldened by the fact that the people of the state still has sympathy for the Adeleke family due to the circumstances that surrounded the death of Senator Isiaka Adeleke. However, informants regaled us with what Demola and his children did to Davido, when he lost his mother almost 13 years ago. It was revealed that, when David lost his mum, Mrs. Esther Adeleke, the talented musician was so small and young that there was no way he could take care of himself, and that it was resolved that David should be taken care of by Demola and his family. But to the surprise of Deji Adeleke, David was said to have been maltreated by Demola and his children, Shina Rambo and B. Red to the extent that Demola’s two sons, who are older than David, always beat David and after the beating, both of them will tell him ‘F.uck you poor boy. Hey your mum is dead and gone,’ while David will cry his eyes out. We were told that this continued as Demola would not caution his boys until the bubble burst and Deji heard and saw how they were maltreating his son. Sources told us that Deji decided to take the poor boy away from them and henceforth decided not to give Demola any financial support again, while Isiaka now took it up from there; taking care of Demola and his children. “It was when Isiaka died that Deji now started giving Demola money, but David didn’t pick his calls until of recent and he didn’t give money to Demola and his children, who used to maltreat him in the past until recently. “He just started giving them audience and little money compared to what David has and controls and as you can see, he doesn’t take them to his outside the country big tours and shows and he doesn’t really flow with them. “When some of his pals noticed, they asked David, he said that if not for God, he shouldn’t even talk to them or have anything to do with them based on what they did to him when he lost his mother and the way the maltreated him then,” said a source. Sources revealed that Demola has children from different mothers and that he is a drunk. As a further proof of his indulgence, the federal lawmaker is said to be wooing a 25 year old to become his new wife. Adeleke, who just celebrated his 58th birthday, iscredited with having three “wives” already. Those who should know disclosed the identity of the lady the Senator appears keen to make his newest wife as “Debola”. 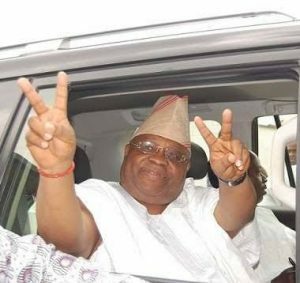 0 Response to "Revealed: Reckless Life Style of Dancing Senator, DEMOLA ADELEKE -Why He Wants To be Osun State Governor"